If you're looking for auto repair manuals online, ALLDATAdiy will be one of the first names that will turn up no matter who you ask. What is makes it so popular and is ALLDATAdiy worth it? With its huge library of diagnostic and repair information for over 30,000 vehicles (and counting), you will be able to find a full manual that is specific to your vehicle's year, make and model. It is much quicker and easier to troubleshoot and repair your vehicle when you're working with instructions and diagrams that are tailored for it. The information they provide for each vehicle far exceeds what you get from a standard owner's manual - Diagnostic trouble codes, maintenance information, repair procedure and detailed diagrams. The wealth of diagnostic information available (including vehicle-specific OBD codes and testing procedures) also makes it easier and quicker to troubleshoot problems. 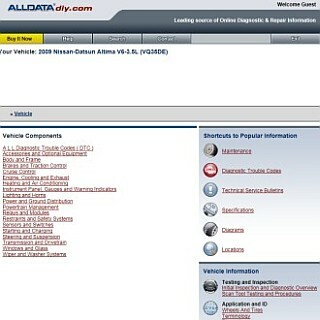 I also like how they separate their routine maintenance and repair information for every single vehicle part. All the required information to carry out major repairs is there: clear diagrams, full parts list and step by step repair instructions. Click here to see a sample of their diagnostic and repair information. If you pay attention the next time you visit your car dealership or auto repair shop, you will notice that most (if not all of them) get their repair information from this site. Every auto shop that I have worked at is a subscriber of their premium service (that grants data access to all available vehicles instead of one). With most factory manuals selling for $50 to $250, ALLDATA is a bargain at $20++ for a one year subscription ($40++ for a five year subscription) . The subscription cost also covers regular updates, including the most recent TSB information and latest prices of OEM parts (helpful!). While it is always more detailed and helpful, the amount of information it offers for some vehicle models is quite similar to what you will find on a printed factory manual. That said, it is still more convenient and cheaper than a high priced factory manual. It may take some time getting used to its sheer amount of information (averaging hundreds of pages for a single vehicle). To be fair, its well organized layout and search function does help me find what I need. Its instruction also tends to very detailed which is great for first time mechanics and major repairs but takes more time to read. As a professional technician, I find myself skipping sections for simpler repairs. As a long time user of this service, I can understand why it is indispenable to so many auto shops and dealerships - There is just no other resource that offers as much auto repair information at such reasonable prices. Whether you're an amatuer mechanic attempting your first repair or a DIY enthusiast carrying out major upgrades, ALLDATAdiy.com will help you cut down repair time, save on repair expenses and avoid expensive mistakes. As a certified mechanic and satisified user, I highly recommend it.